A new staging of Macbeth, not seen here since 1987, opened the Los Angeles Opera’s 2016/17 season. 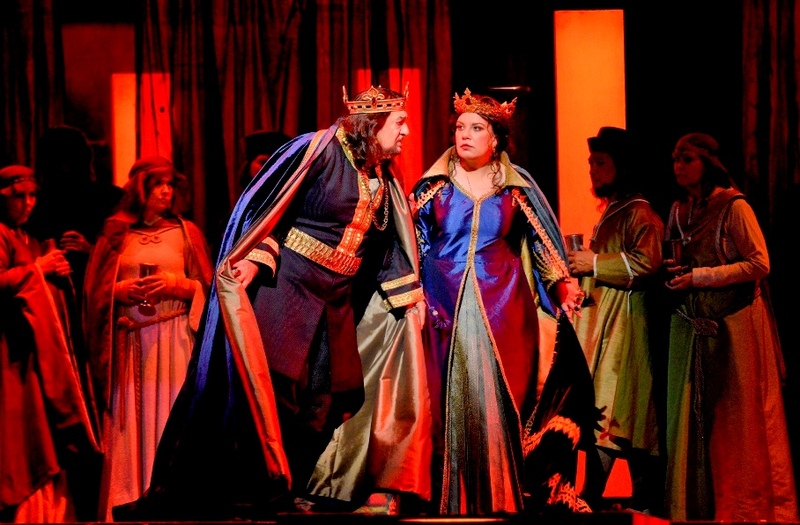 The production team hails from film (costume designer Suttirat Anne Larlarb) and Broadway (director and set designer Darko Tresnjak) and mounted a dynamic, visually compelling staging to complement Verdi’s powerful music. Subtle it is not, but neither is this early Verdi opera from 1847, which contains plenty of gore, sinister elements and raw emotions. The imposing sets of a Scottish castle’s rampart serve as the backdrop for all the opera’s actions. As the curtain rises, the first characters we see are the hellish cat-like creatures scaling the castle wall during the witches’ chorus. These ‘invisible’ sinister critters with long tails will return in nearly every scene to heighten either the action or the spook factor, usually to great effects. One advantage of relegating the majority of actions to the dancing, witching creatures is that it frees up the chorus to do what they do best – singing. The Los Angeles Opera Chorus sang prominently and magnificently all evening, in the opening witches’ chorus, the rousing patriotic ensembles, and the moving Act 4 hymn of oppression and despair “Patria oppressa”. As any aficionado of Verdi’s Macbeth will tell you, the most important role in the opera is that of Lady Macbeth (and Maria Callas being the greatest of them all). Not so in this production. At the post-retirement age of 75, Plácido Domingo is singing the title role and all eyes and ears were on him on the opening night. Fortunately, at an age when most singers are content with secondary comprimario roles, Mr. Domingo shows the world he’s still got game (and plenty of ringing high notes). In the Act 1 entrance duet with Banquo, his singing had the confidence and power of a singer half his age. Even though Macbeth is a flawed, tragic character, Mr. Domingo managed in his multi-faceted verbal and musical inflections to inject sympathy and pity into the Scottish king doomed by the ambitions of his malevolent wife. Russian mezzo-soprano Ekaterina Semenchuk gave a compelling portrayal of the diabolical Lady Macbeth (those long-tailed dancing devils are going crazy in every scene that she’s in). Sporting a lusciously beautiful instrument, this Lady Macbeth does not resort to artificially “hard, stifled and dark” voice as specified by Verdi, but instead used her voice musically through skilled modulation to achieve the same dramatic effects. Memorable highlights were her witch-like staccato in the Act 1 duet with Macbeth (where she showed great vocal chemistry with Mr. Domingo), and a beautifully floated high note that closes Lady Macbeth’s sleepwalking scene. 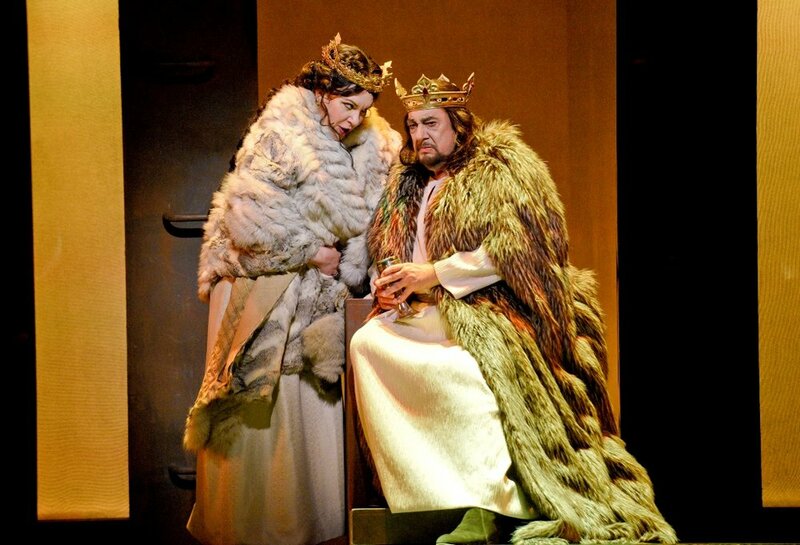 Italian bass Roberto Tagliavini has the right voice for the short role of Banquo, which is often miscast with a bass-baritone. His acting was excellent and delivered a solid fortissimo at the end of his Act 2 aria “Come dal ciel precipita” before falling victim to a gang of assasins. Mexican tenor Arturo Chacón-Cruz was a surprise hit of the evening, singing Macduff’s tragic aria “Ah, la paterna mano” with great slancio and ringing intensity. James Conlon has been L.A. Opera’s Music Director for ten years and, instead of settling into routine, seems to get better every season. In Macbeth, Conlon showed he had the old-school style and flare of early Verdi experts like Lamberto Gardelli or Ettore Panizza (or even that vastly underrated but beloved Nello Santi). Staggering power and drama were unleashed from maestro Conlon's baton. From the perfectly molded phrases and shimmering strings in the overture to the thundering apotheosis of the final chorus, the orchestral pit of the Dorothy Chandler Pavilion rarely sounded this good. Six performances of Macbeth remain on Sept 22, 25, Oct 5, 8, 13, 16. The Oct 13 performance will be simulcast live, free of charge, at South Gate Park and the Santa Monica Pier.